Juki HZL-DX7 Computerized Sewing and Quilting Machine $1,399.00 - FREE SHIPPING! If you are looking for a high-performance machine that is still light on the budget and easy to carry around, the Juki HZL-DX7 is exactly what you are need! Focusing on making a machine that is user-friendly, efficient, and full of great features, this sewing machine is what every sewist would love to own. The Juki HZL-DX7 is one of the higher end machines that Juki makes. 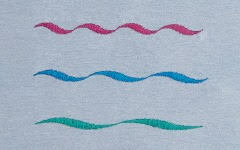 It can be used to make even and consistent straight stitches, great zigzag stitching, and beautiful free-motion quilting. For beautifully even stitches, the Juki “box feed” is integrated into this machine, ensuring consistent and even fabric feeding. The HZL-DX7 handles thicker fabrics and layers beautifully thanks to this unique feeding system and can stitch through any type of fabric whether lightweight, heavyweight, or stretch. If you would like your quilts to come out beautifully without any stitch pulling, just set the Juki HZL-DX7 to sew with the presser foot lifted and floating ever so slightly at a setting of your choice. Button holes are created with ease through the sensor buttonholing system that Juki uses. There are 16 choices of buttonholes types so you can choose which one best suits your project. 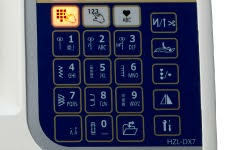 With the Juki HZL-DX7, you can select patterns and stitches with the touch panel and choose from 80 stitches including alphabetical/numerical fonts! There are buttons that are easy and quick to select that control the machine, including reverse or lock stitch, thread trim, needle up or down, start or stop, and auto-lift presser foot. You can also assign a function to the foot switch/pedal’s heel portion for easy access. 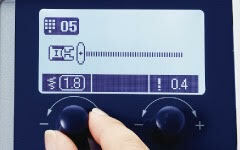 Sewing speed on the Juki HZL-DX7 can be adjusted to a maximum of 1050 stitches made in a minute. For ease of use, if you need to sew on tight corners or be particularly precise with your stitches, you can use the low-speed or inching sewing function. 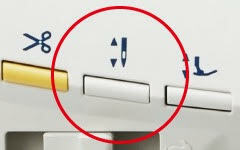 Your stitches can also be adjusted in length or width with the easy adjustment dial. The machine comes with 30 accessories, and includes the Juki warranty of 5 yrs mechanical parts, 2 yrs electronic parts, and 90 days on defects whether of workmanship or material. The Juki HZL-DX7 - A Feature-Rich Dream Machine! Low-speed Inching sewing - By pressing and holding the needle up/down button, you can sew slowly. Sew corners, stop, and start with precision. Elongation pattern - Change the overall length without changing the sewing density of the pattern. Stitch adjustment dial - Use the easy-to-operate dial to adjust the width and length of the stitch. The dial also lets you make slight adjustments while sewing zig zag stitches. 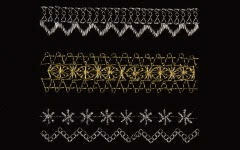 Lace-like patterns - Sewing several patterns in parallel creates lovely lace-like stitches. You can enjoy the combination of patterns that give the image of dedicated lace braid. The best sewing machine for garments making: very efficient, precise stitching, fast, simple to use. It far overpasses my Babylock Ellisimo gold for sewing garments. To get acquainted to the machine, I made a sample of every stitch, and of every functions offered by this machine. WOW ! It is very pleasant to customize the functionalities (eg. : selection of the stitch patterns by light touch, subtle selection sound, tried all possibilities for the foot control, knee lift, adjustable starting and reverse speeds). There is no waste of time with this machine: everything is set up in a breeze. The main presser foot worths a lot by itself: very easy to get a precise stitching, the distances on the throat plate are indicated from the center of the foot, and no need for another presser foot for topstitching with a straight stitch. I can adjust every stitch (width, length) in real time with the dials while sewing (very useful and fast for ending darts). Using the straight stitch slide plate is quite a pleasure: very fast (instead of unscrewing the whole plate in my Ellisimo), and there is no danger of doing the mistake of sewing a zigzag stitch in that small hole because the machine allows only the straight stitches. And, perfect straight stitches in a sample of light charmeuse silk, without any need of a stabilizer. If it happens that the stitch patterns (eg. letters, words, flowers, etc.) are unrecognizable at first try, there is a simple way to fix them: we just have to make an adjustment called " Adjusting the darning", and "voilà", like magic, without any need for a stabilizer ! The floating function is impressive: my sample was a sandwich of silk dupioni (slices of bread) and 2 layers cotton batting: WOW ! Perfect diamonds, no puckering at all, no need for the walking foot, all the stitch patterns allowed ! The buttonhole presser foot is very simple to use (no side lever), and very performant. Perfect button holes (even the manual buttonhole is perfect), 3 widths. I prefer the needle threader on the Juki over the one of Babylock Ellisimo. All the feet / bobbins of my Ellisimo, Singer quantum stylist, Brother are compatible (which I would not have bought if the juki would have been available many years ago). I also tried many Janome at a sewing center in my town, and none of them had as many advantages as the Juki. The machine was shipped from SewVacDirect and arrived by UPS in excellent condition. This machine was purchased as gift for my wife and she loves it. This model comes with all the accessories you could ever want. The automatic button sizing shoe is incredible. It is a solid machine and should provide years of service. Sew several layers of denim like butter! I bought this machine from a Juki dealership. The stitches are beautiful & perfect after I set it on 1 other than AUTO. It sewn through 7 layers of denim without a hiccup with the needle that was already on the machine when I got it out of the box, a size 12/80 probably. I have the JukiTL 2010q for straight quilting & I am impressed with the performance of Juki sewing machines. The next machine on my list is the Juki serger with the air loop.